The recent revelations of Edward Snowden should have come (the existence of surveillance programs of the U.S. Government) as no surprise. Nevertheless they bring to the fore the perennial questions of the rights, obligations, and power of individuals against the Government or the sovereign authority of the territory they inhabit as well as the limits of the power of the latter and the source of its legitimacy. 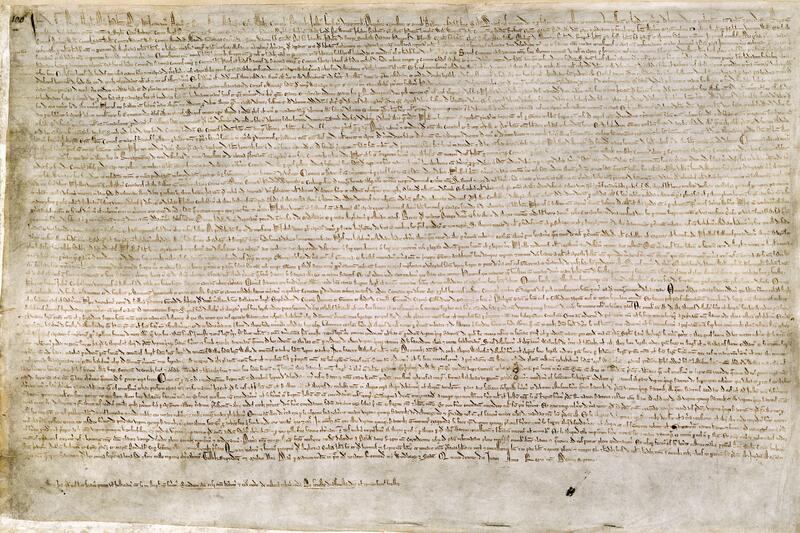 Here is an image of one of four known surviving 1215 exemplars of the Magna Carta. This text speaks to due process, i.e. the idea that every person is entitled to security against the arbitrary exercise of power. We are agonizing and fighting over the same idea today in a very different environment. Most significantly the power or forces available to Governments relative to those an individual or group of individuals can command have grown immensely since the days when weapons for everybody were limited to knives, swords and bows and arrows, whereas today tanks, fighter aircraft, submarine-launched missiles etc. are not usually kept in private homes or storage spaces. Of course in the 13th century the term “free man” applied only to men, and even then only to the minority of the nobility and not to the vast majority of the residents of England at that time, the rural peasants or villeins. The Magna Carta was about one group of privileged and powerful people protecting themselves from someone who was even more powerful and privileged. But since then the Magna Carta has come to mean something much broader and more fundamental, just as the rights embodied in the U.S. Constitution were finally extended to include all Americans even though in the 18th and well into the 19th century slaves with no such rights were intimate members of and contributors to American society that many Americans did not consider deserved such rights (and often justified their position by references to the Bible). It is sobering to recall that King John only agreed to the Magna Carta to buy time. He appealed to the Pope to declare the document null and void. Within a few months the Pope granted him his wish. After all how could or why should the Church in Rome deny the divine right of a temporal ruler it recognized who (pre-Reformation) submitted to papal authority just to support the idea that individuals should not be subjected to arbitrary and unchallengeable punishment? Even today this Church tries to deny the right of individuals who do not share its faith to act in ways of which it disapproves, that cause no one any harm, arguing that its allegedly unique God-given or divine authority transcends and must trump individuals’ freedom in these matters. Therefore thanks to the Pope the Magna Carta became invalid in less than three months. Nevertheless the death of King John in 1216 secured its future. Its influence is felt to our day in the U.S. Constitution and the U.N. Declaration of Human Rights. The Magna Carta has played a key role in the centuries-long historical process that has led to the rule of constitutional law in the English-speaking world. It is ironic in light of today’s linguistic controversies about the use of other languages than English to recall that this seminal document for English speakers was first written in Latin and then a few years later translated into vernacular French. French or rather Norman French was the language of English nobility and the royal court after the successful Norman invasion of 1066. I think – but am not certain – that the first English King for whom English was his native language did not ascend the throne until towards the end of the 14th century, and it was only during the early part of the 15th century that English replaced French as the language used by courts in England. Current debates in the U.S. about the true character and nature of this country and hence the choices we face today would be vastly more productive and constructive if more of us had a better sense of the controversies, uncertainties and messiness of our progress over the centuries, as the story of the Magna Carta illustrates towards a more just and civilized society. Instead we prefer to hide behind simplistic (and conflicting, no compromises allowed) notions of what it means to be a “real American” or assertions such as that the U.S. was founded specifically as a Christian nation. It is true that many of the founders of the United States belonged to Christian churches of various denominations that disagreed among themselves sometimes violently on important matters. One of the strokes of genius in the founding of the U.S. apparently forgotten or ignored by some contemporary Americans lay in the decision that there should be no “official” state church, Christian or otherwise, a wise compromise the art of reaching which seems to have disappeared from today’s Congress. As for Edward Snowden I find it difficult to judge whether what he has done – that violates commitments he presumably made as a condition of his employment – can be justified by a higher loyalty to the principles embodied in documents such as the Magna Carta and the U.S. Constitution, as well as in other expressions of inalienable human rights. These documents too limit the power of sovereign authorities over individuals whatever is their standing in life. If he has in fact revealed information that for example permits the identification of undercover agents working for the U.S. Government then his actions fall into a different category than if he has just revealed the obvious – i.e. the existence of surveillance programs – in such a way as to provoke a serious and necessary debate about whether the powers of surveillance of the U.S. Government are being monitored independently and honestly in their application or are being abused. This debate should also address how best to prevent such abuses that even if not the practice today may become the norm in future Administrations. As far as I can tell Snowden is not motivated by financial greed or by an ideology fueled by selfishness or by hatred or disdain for significant groups of humanity. His motivations distinguish him positively from the motivations behind policies being approved by majorities in today’s House of Representatives Indeed Snowden seems to have given up a very comfortable position and life style in order to make his point.